Half fill a large bowl with water and add the juice of 1 lemon. Working with 1 artichoke at a time, cut off the stem flush with the bottom. Pull away and discard any blemished outer leaves. 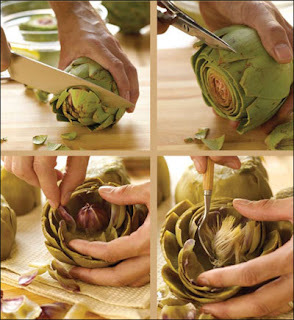 Lay the artichoke on its side and, with a large knife, cut about ½ inch off the top, to remove the prickly tips. Use kitchen scissors to snip off the prickly tips from the remaining leaves. Rinse the artichoke under running cold water and place in the bowl of lemon water. Repeat with the remaining artichokes. The artichokes are now ready to steam or boil until tender. To remove the choke, invert cooked artichokes on a folded kitchen towel to drain and cool. Then stand the cooled artichokes stem side down. Use your fingers to gently spread open the leaves at the top to expose the prickly-tipped center leaves. Grasp the leaves with your fingers and pull them out. Reach down into the artichoke with the tip of a spoon and scrape away the fuzzy choke. The artichokes are now ready to stuff and bake, or chill and serve cold with mayonnaise or a vinaigrette dressing.